Let me take you back in time for a few minutes…. The year is somewhere between 1980-1984. The place is South Philadelphia. The scene is my mom and I; early on Sunday mornings walking the 7 blocks from our row home to the Termini Brother’s Bakery (a Philadelphia institution). Waiting in line for the tea biscuits that would come fresh out of the oven. I remember this as if it were yesterday…Sunday morning tea biscuits were a special treat. We would eat these flakey raisin studded scones toasted and spread with butter. It’s 2012. I’m living in Phoenix Arizona. My mom who now lives just a few miles away is seated with me at my kitchen table. In front of us is a plate of tea biscuits. Not Termini’s but ones I recreated during a recent Virtual Potluck event with King Arthur Flour and Red Star Yeast. All of the VP bloggers were given products from both Red Star Yeast and King Arthur’s Flour…two quality companies for obtaining all of your baking needs. The task was to come up with a recipe using these products. Sounds easy, right? Well one of the items I was given was a sourdough starter. And I've never worked with a starter before so this was a challenge for me. Anyway, back to the tea biscuits. I went with a pretty basic sourdough scone recipe; added some golden raisins and did an egg wash on top to get the brown color I remembered. The result was delicious....not quite the flakey texture of Termini's but still really good. I will definitely make these again. Preheat an oven to 400 degrees. Sprinkle two baking sheets lightly with flour. Whisk together the flour, salt, cream of tartar, baking soda, sugar, and golden raisins. Cut in the slices of butter with a knife or pastry blender until the mixture resembles coarse crumbs. Add the sourdough starter and mix by hand to form a soft dough. Turn the dough out onto a lightly floured work surface. Using a floured rolling pin, roll dough into a 1/2-inch thick round. Use a biscuit cutter to cut into circles and place the scones on the prepared baking sheet about 1 inch apart. Re-roll dough if needed. 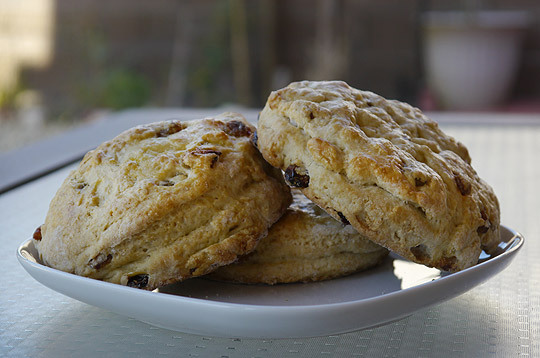 Lightly brush the tops of each scone with the egg wash. Bake until the scones just start to turn golden ~15 minutes. Remove from baking sheets and cool. Enter to win A Baker's Dream Giveaway! One lucky winner will receive from King Arthur Flour one (1) dough whisk, one (1) coupon for a bag of flour in the supermarket, one (1) sourdough starter, and one (1) bag of Pumpernickel Flour. But that's not all! Red Star Yeast is adding three (3) strips of yeast, one (1) bread loaf pan, one (1) apron, and one (1) bread knife to this baking package! 1. Leave a comment on this post; tell me what you would make if you win. Contest ends midnight EST on 6/10/2012. I liked King Arthur on Facebook! I like red star yeast on Facebook! And I really do, it's the only yeast I use! I think I would learn how to make Pumpernickel bread with the Pumpernickel flour. I've never used it before! I was already a fan of King Arthur flour on Facebook! I would never have thought to put sourdough in tea biscuits - very creative! Loved your story about Philly. I would love to make these tea biscuits or some scones..yum! I like KAF on FB & Twitter. I follow RSY on Twitter. I have commented on other VP blogger sites. I would try sourdough bread and make some pizzas! :) thanks! These look so perfect, I can't wait to try them! I'd bake some sourdough bread! Yum! I commented on other giveaway and follow KAF on Twitter. I follow KAF on Twitter (that's how I learned of this series, and @VirtualPotluck). I'd make bread, and maybe bagels, with the pumpernickel flour - and use all the rest of it for my usual baking! and I commented on Cookistry, and bookmarked that and several others to try the recipes! Have to revive my starter, though, it's been a couple weeks since I fed it. Yum, waffles from the discard. I might try to make the tea biscuits (Le Bus bakery outlet is closer to me than Termini's and I get them there)or maybe pumpernickel rolls. I follow King Arthur Flour on twitter (ljskop). I follow Red Star Yeast on twitter (ljskop). I commented on Miss in the Kitchen's giveaway. I would actually attempt to make Pumpernickel bread. Nice scones, I can picture those with a thin layer of honey...I prefer it over butter. I like King Arthur on Facebook and Twitter. I like Red Star Yeast on Facebook or Twitter . I've commented on Cookistry, Rachel Cooks and Thyme in Our Kitchen so far. Well, I guess I'd need to make some pumpernickel bread, and some sourdough. I follow King Arthur Flour on Twitter and I liked it on Facebook. I follow Red Star Yeast on Twitter and I liked it on Facebook. I follow Red Yeast on twitter! I follow King Arthur on twitter! I follow King Arthur and Red Star Yeast on twitter! Thanks! I really want to try sourdough pancakes sometime, so that'd definitely be one of the first things I'd try if I won! I have been wanting to try making sourdough bread, so would love to win this package! I follow KA Flour and Red Star Yeast on Twitter and I "Like" both on Facebook AND I tweeted about the contest. :-) Thanks! Sourdough Raisin Pumpernickel sounds just about perfect! I would try some biscotti perhaps with the flour or pizza dough. I would attempt to make some sourdough bowls like they make at the local bakery. They plug out a hole and put soup in it, they are awesome. I follow King Arthur Flour on Facebook. I follow Red Star Yeast on Facebook. I have commented on other Virtual Potluck blogs for the giveaway. Love this recipe! Those look like the best tea biscuits ever! I won your last giveaway so I will graciously bow out of this one but It is a great giveaway! I would make whole wheat bread! I will make french bread! Have never cooked with Pumpernickel Flour but would love to try it. I follow KAF on FB. I've commented on other VP posts. I'm following Red Star Yeast on FB. Nice! I'd go for these for breakfast any time. I wod make biscuits and gravy! I would try homemade pizza crusts! I also commented on 30aEats VP Potluck post too! Thank you so much! I'd love to make some homemade white bread!! What a great idea. I hadn't thought of using the sourdough in a biscuit. Add one more to my list to make! I would make bread-- lots and lots of bread! we love sourdough in this house! Yikes! I'd have to make those Tea Biscuits---they look awesome!! I follow Red Star Yeast on Twiitter. I follow KAF on Twitter. I would make Hätäleipä or Finnish Emergency Bread. Tastes extra good with pumpernickle flour! I commented on VP Farmgirl Gourmets blog re Cacao Bliss Cream Tart.